Head men’s basketball coach Bill Curley says he’s working to get maximum effort out of his team on defense and on the boards. But appearance was not reality. One free throw clanged off the rim. The team ran. The next one got nothing but net. They ran again. As the Lions look to improve on their 36.3 rebounds per game last year, last in the conference, head coach Bill Curley said he’s adopted the persona of a part-time running coach. Last year, point guard Geoff Gray, the team’s leading scorer, was also its leading rebounder in his sophomore season. The team’s other top guard, Michael Sheng, finished second in rebounds. Sheng, a senior, said he’s teaching teammates to have a me-first attitude on the boards. Curley said his starting lineup is a work in progress, but he’d like to get the 7-foot-1-inch Mac Sashin and the 6-foot-11-inch Will Lantier on the court together. He said rebounding will once again be more of a team concept with the Lions now two years removed from rostering the NEWMAC’s leading rebounder, Austin Pinckney. “Good teams rebound well as a team, so we’ve stressed a lot of rebounding early on in the preseason, and embracing the contact,” Curley said. Ahead of last season, Emerson lost 71 percent of its offensive production after graduating 10 seniors. But the team graduated only two in the spring, setting up what Curley said will be a deeper roster this year. Last year, the Lions failed to qualify for the NEWMAC tournament for the first time since joining the conference in 2013. They finished 7-18 overall and 3-11 in conference play. Gray paced the offense, earning second-team all-conference honors in the process. He averaged 18 points per game, good for third best in the NEWMAC, and at times took over games, including a career high 35-point performance against Springfield in January. Gray, who was named a captain, is on track to reach 1,000 career points this season, and he expects a stronger supporting cast to benefit the team. 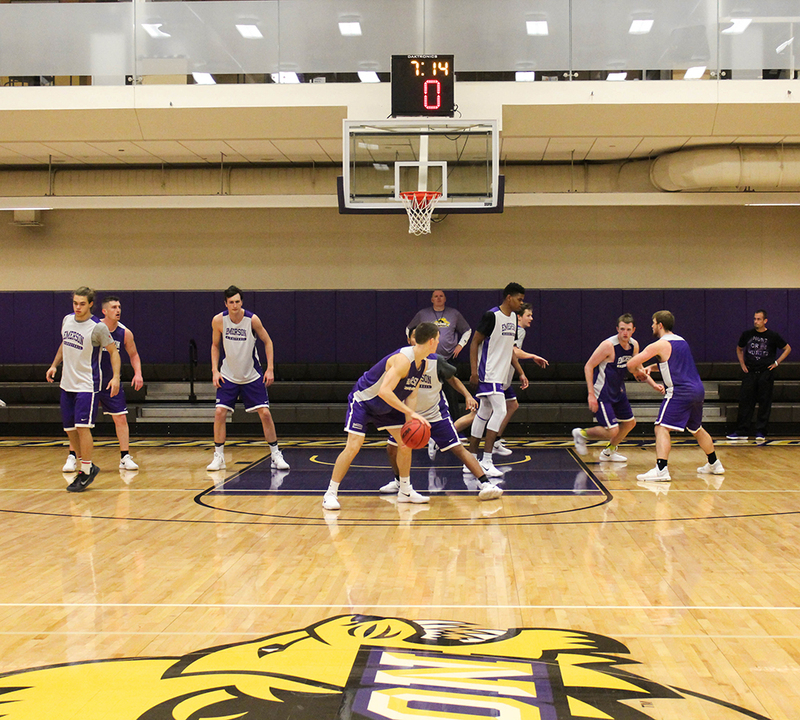 Gray said Sheng and freshman Ethan Gabert-Doyon should see time at the point, and he expects the return of the team’s nucleus will force defenses to focus on all five players on the court, rather than isolating him. Curley said a healthy Jack O’Connor, who was lost for the season to injury after flashing serious scoring potential in a January loss at Coast Guard, should immediately help the offense. O’Connor scored 10 points in 13 minutes against the Bears, and grabbed four rebounds. In fact, Curley doesn’t expect scoring to be an issue at all. He said he’s more concerned with solidifying the defense ahead of Emerson’s regular season opener against Newbury on Saturday. The Lions added four freshmen in their 2017 recruiting class, and picked up transfer guard Justin Ventura. Curley said Gabert-Doyon stood out playing on a top high school team at Brooks School in North Andover, Massachusetts. Emerson also picked up San Diego native Sean Kelly to bolster the backcourt. Curley said Kelly is coming off injuries in high school, but doesn’t take bad shots and is a high-percentage shooter. Down low, the Lions added Jaelen Ogadhoh, a 6-footer from Portland, Oregon, and Jacob Ries, a 6-foot-4-inch forward from Mesa, Arizona. Curley said Ogadhoh can help with rebounding and physical defense, but is still getting comfortable with the college game after also dealing with injuries in high school. He said Ries, who was featured on SportsCenter’s Top 10 Plays in high school, brings the tempo of a West Coast style offense to Emerson. Curley said the depth of the roster will allow the freshmen more time to learn the college game. “That’s the great thing about this year—a lot of guys had experience last year and know what it takes, and these other guys got to catch up to them, so it’s not like we’re going to throw you out there,” Curley said. While Emerson’s season starts on Saturday, the Lions don’t play their first NEWMAC game until the new year, hosting Coast Guard on Jan. 3. The annual conference preseason coaches’ poll, which projects the playoff contenders, placed the Lions and Bears in a tie for the fifth and final postseason spot. Emerson defeated Coast Guard, Clark, and Wheaton in conference play last season, and Curley said those four schools will continue to grapple to unseat one of the upper-tier programs—Babson, MIT, Springfield, and WPI.